NEW YORK CITY — There are plenty of ways for New Yorkers to take a hike outside the city, but there are also ample opportunities to commune with nature without ever leaving the five boroughs. The city's public parks boast dozens of hiking trails for those who want to stay local, with paths through hardwood forest, a salt marsh or freshwater wetlands. "There are many people who are even avid park users who are not aware of the kind of hiking opportunities that exist right here in New York City," said Sarah Aucoin, director of the Parks Department's Urban Park Rangers. ►Some great summer hikes without a car. ►How to spend a fun summer day in the Bronx. ►7 places you can drink on the waterfront this summer. Those looking to embark on a trek through one of the city's trails should remember to pack water and sunscreen, and it's important to always stay on the designated trails, according to Aucoin, who recommends wearing light-weight clothes that cover the arms and legs to protect against bug bites or poison ivy. "Although it's New York City, these are real hiking trails," she said. "You prepare the way you would for any hike." 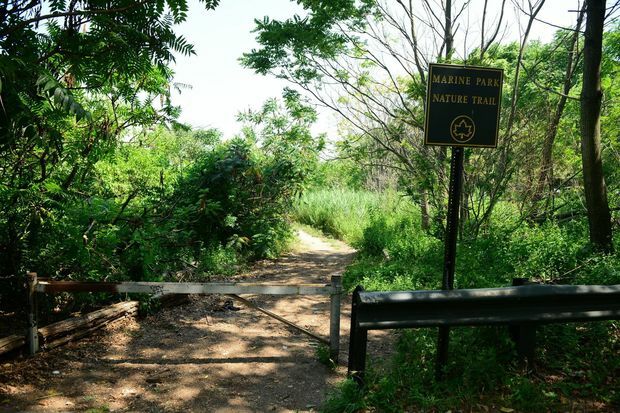 The Bronx's Pelham Bay Park offers the Kazimiroff Nature Trail, an approximately 2-mile hike that loops through a section of the park known as Hunter Island. Enter from the northern corner of the Orchard Beach parking lot. You can choose to hike a shorter 30-minute loop or a slightly longer 45-minute path, both of which wind through a variety of landscapes including meadows, shrubland and forest, with views of the Long Island Sound. "You're actually winding your way through a lot of different ecosystem types," said Aucoin, who added that scenery includes a stretch of rocky coastline that's reminiscent of what you would expect to see in Maine. "You won't find it anywhere else in New York City," she said. "It's a little slice of New England popped right down there in the Bronx." Find directions to the Pelham Bay Park here. Inwood Hill Park offers visitors a peek into New York's past: it was once inhabited by Native Americans known as the Lenape, and legend has it that the park was where Peter Minuit purchased the isle of Manhattan from them in 1626. "In many respects, it gives you the sense of what Manhattan might have looked like," said Aucoin, who said the park is often used for historic programs with school groups. Richard Barr, a member of the local hiking group The New York Ramblers, said the park is among his favorite trails in the city. "[It] has some really nice hills on the western side, sort of overlooking the Hudson," he said, adding that there are many opportunities to spot old caves and other interesting landmarks. Aucoin recommends the Blue Trail, an approximately 2-mile path — indicated by blue markers on trees — that starts near the Inwood Hill Nature Center at 218th Street and Indian Road. It offers opportunities to see nesting red-tailed hawks and owls, as well as tulip trees, generally recognizable as the tallest and straightest trees in the forest. "We have magnificent tulip [trees] growing in Inwood Hill Park, and the Blue Trail is a great place to spot them," she said. Find directions to Inwood Hill Park here. Marine Park includes the Salt Marsh Nature Trail, also known as the Gerritsen Creek Nature Trail. It can be accessed behind the park's Nature Center near the intersection of East 33rd Street and Avenue U. The path is slightly less than a mile long and follows the shore of Gerritsen Creek, which empties into Jamaica Bay. Its second half winds through a prairie of tall grass. "It's a beautiful trail just to go out and commune with nature," Aucoin said, adding that the U.S. Army Corps of Engineers recently finished a large restoration project at Gerritsen Creek, which helped clear the area of invasive plant species. "It's even more beautiful now, and it is actually all native plants," she said. The trail is home to a variety of bird life, including a pair of nesting osprey and two young fledglings which hatched this year. Find directions to Marine Park here. A 2,880-acre network of parks and green spaces in the center of Staten Island, the Greenbelt boasts more than 35 miles of marked hiking trails, from short loops to a 12-mile path, many of which can be accessed near the park's nature center at 700 Rockland Ave., where visitors can pick up a trail map and plan their hike. 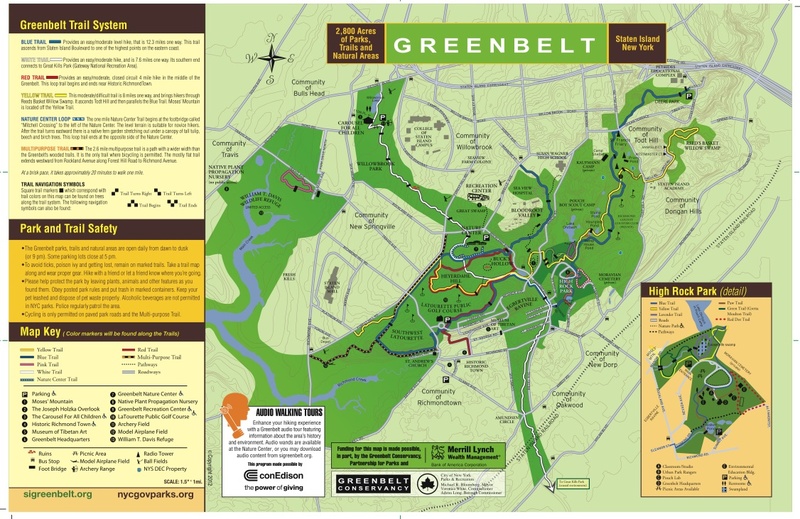 "There's a little of something for everyone," said Dorothy Reilly, public relations director for the Greenbelt Conservancy, who said their most popular path is the Blue Trail, a 12.3 mile easy-to-moderate path. "It's kind of in the center of things, it's got a lot of variety and it's a little bit challenging in some spots," she said, adding that elevated points along to trail offer vistas for hikers to catch scenic views. The Conservancy also offers audio tours and group hikes led by experienced tour guides. "Whether it's someone whose forte is history or biology or botany, they lend their expertise to the hikes," said Reilly. The Conservancy's events calendar can be found here. Find directions to the Greenbelt here. The landscape of Queens' Alley Pond Park was formed by a glacier some 15,000 years ago — it left boulders in the green space which can still be seen today. "It's a great place to witness the remnants of long ago glacial activity," said Aucoin, who said the great sheet of ice left behind the rocky debris, as well as depressions in the earth that are now kettle ponds. She recommends the park's White Trail, which is located behind the ballfield by Winchester Boulevard, north of Union Turnpike. "It roughly outlines the perimeter of the park and it is a little hilly so you get some up and down," she said, saying the trail offers chances to spot hawks, as well as frogs and salamanders. "If you're walking with kids this is a great trail, because there's a lot of little places to explore and look for creatures," she said. Find directions to Alley Pond Park here.